Westbourne Motorsport were crowned 2018 Renault UK Clio Cup Champions after BRDC Rising Star James Dorlin secured the coveted title on a dramatic Finals Day at Brands Hatch. The title – Westbourne’s first in the hotly-contested single make category – serves as a just reward in a season that has garnered six race victories, ten podium finishes and a quartet of pole positions and fastest laps apiece. However, the Worthing-based outfit endured a far from easy run to the UK’s biggest single make prize, arriving at the 2.4 mile Grand Prix loop with a 7 point deficit to close on their chief title rivals. 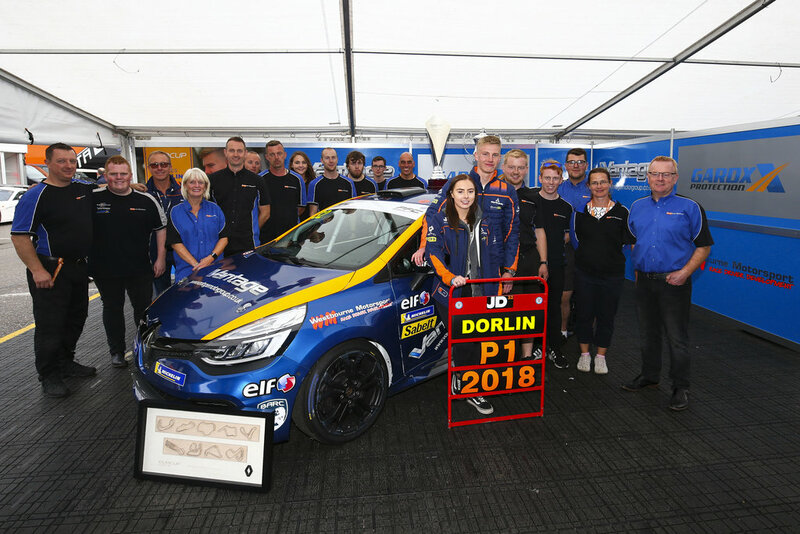 Crucially, Dorlin’s sublime qualifying form continued and the Vantage Motor Group and GardX Protection-backed racer put himself ahead of the opposition on the grid for both races. The final spot on the podium after a thrilling scrap with Bradley Burns put Dorlin to within 3 points of the championship lead, as all eyes turned to the season finale – screened live to the nation on ITV4 – with the Barnsley-based racer on the front row. He made no mistake, seizing the lead into Graham Hill Bend before extending his advantage. Though two safety car stoppages threatened Dorlin’s supremacy, he re-asserted himself on both occasions and took the chequered flag 4 seconds clear of Daniel Rowbottom, sealing the title in the process. Team mate James Colburn’s support proved invaluable to the cause, aiding Dorlin in qualifying before rounding out his own campaign with a brace of solid points finishes in seventh and sixth respectively after carving his way through the field – 15 positions made up in total from his starting slots across the weekend. His focus will now shift to a guest appearance in the Michelin Clio Cup Series next weekend at Silverstone, with a final flourish of silverware on the cards. Ben Colburn underlined his future potential with a maiden Graduates Cup success in the season finale, and concludes a part-campaign with six points finishes to his name, and a winter to get better acquainted with the fourth generation Clio ahead of a full assault next year. James Colburn (#7) said, “This weekend as a team there was only one objective in mind and we’ve achieved it, thanks to great driving by James. We all did what we could to help, and it’s a phenomenal success. “Personally, I gained 15 positions from my starting slots across the two races which is a positive note to end the season on. Now I’m looking forward to seeing what we can sort over the winter months for next year. James Dorlin (#32) said, “I am just so proud of what we’ve all achieved as a team. The support I have from my sponsors – Vantage Motor Group, GardX Protection, Harlequin Teamwear and Prototype Creative – is exceptional, as well as my family. “A lot of hard work has gone into making this season happen and to top it off as Champions is fantastic. Ben Colburn (#55) said, “For me, it was such a great weekend and a big confidence booster as I gained my first top ten finish in the championship and then followed it up with a maiden Graduates Cup victory in the finale! “A huge congratulations to my team-mate James Dorlin on winning the championship too, it’s richly deserved and I’m so proud of the team for the success.